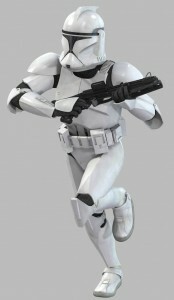 Episode 2 style Clone Helmet – Fanmade bucket. Some “name brand” helmets may be unacceptable. Rear fin needs a brake light cover installed. Primer grey stripe around back of dome. Ear holes may be painted light grey or remain white.